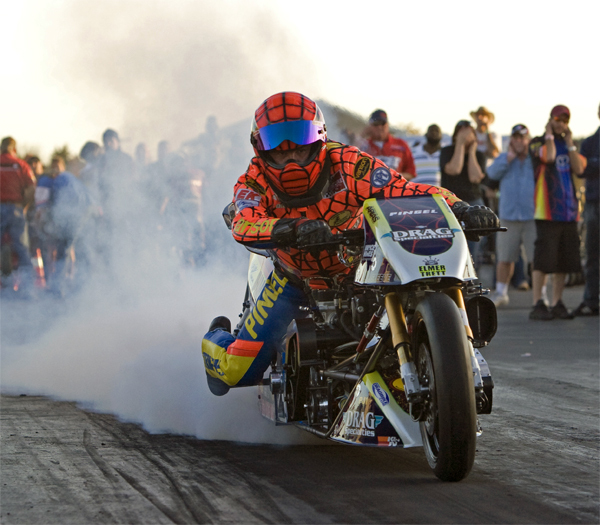 Ten Time Top Fuel AMA Motorcycle Drag Bike Champion Larry “Spiderman” McBride made it into the 2010 Guinness Book of Records. The U.S. drag racer went 245.36 mph for the official fastest quarter-mile on two wheels. McBride finished the 2009 campaign with four victories on the AMA Dragbike tour. "My highpoint took place at Atlanta Dragway in March," said McBride. "I lowered the AMA Dragbike elapsed-time record to 5.793." 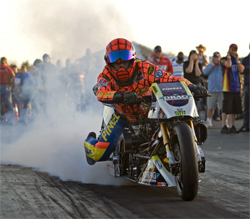 The ten-time class champion will be back in full swing with the 2010 AMA Dragbike Schedule. It kicks off March 5-7 with the B&B Promotions Bikeweek Nationals at South Georgia Motorsports Park in Valdosta, Georgia. He will also continue his work with motorcycle rides which benefit children with cancer.